I finished the leather pinafore a few weeks ago! 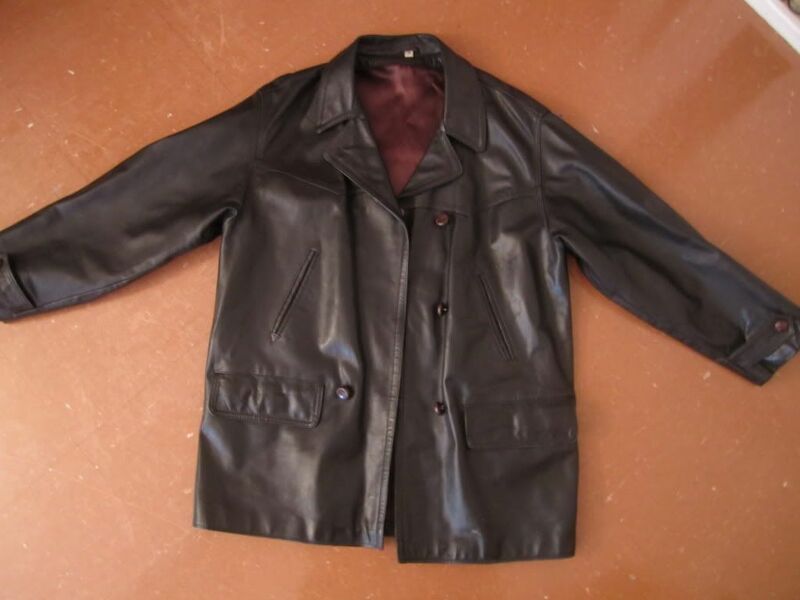 for newer readers, the leather pinafore started out as this enormous jacket from Goodwill. 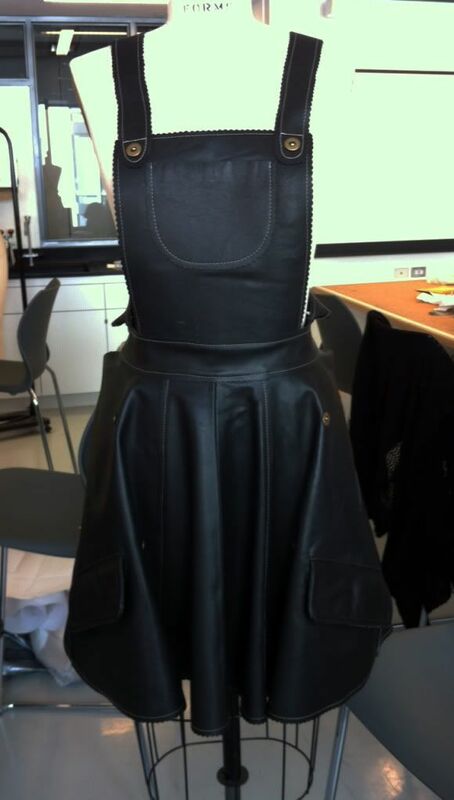 Earlier this week, the finished garment was shown at a conference on sustainability at my school as a reclaimed garment! yay! so many pockets! it's great for sewing and crafts because there's a place for everything-- bobbins, chalk, scissors, tracing wheel, anything! And here's the back! The adjustable waist tabs are actually the sleeve tabs from the jacket. I feel the need to add that Rikki asked to try it on, there was no coercion involved. 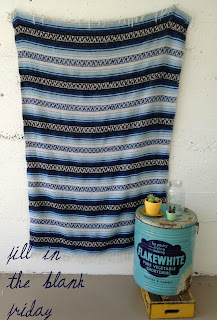 Have you finished any projects lately? 1. My greatest strength is perseverance. If I want to learn how to do something, or if I want to accomplish something, I stick with it until it's done and done as well as I possibly can. ...I also like to think of myself as being a pretty nurturing person. 2. 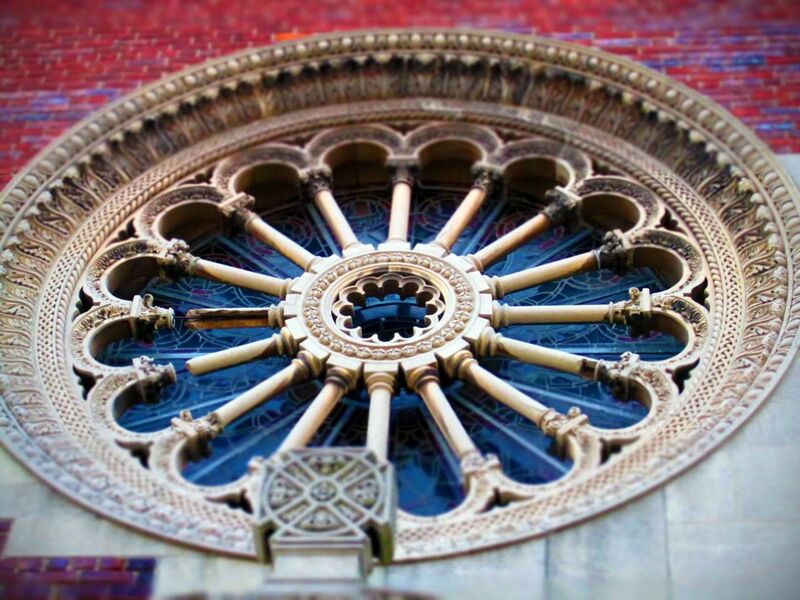 My greatest weakness is my perfectionism... On one hand, it means that I do things as perfectly as I possibly can. On the other hand, it means that I can get fixated on small details and that I'm pretty tough on myself because I have really high standards for my work. On the other hand, why do something if you're not going to do it right? And now we're working with three hands. So that's where we're at. 4. If you found me procrastinating, I'd probably be reading blogs, blogging, pinning things on Pinterest, or toodling around Etsy. 5. The most cozy place in all the world is the living room in my house when I'm at home during the winter. Our woodstove makes the most satisfying wood-crackly noises, and it's wood-paneled so the whole room just has a lovely warm glow. 6. Something new I tried recently was making pants! I'm not a pant person, I wear dresses pretty much every day. I'd made pajama pants and yoga pants and leggings before, but never actual trousers (except those icky wide-leg corduroy ones we make in second semester sewing. I don't count those.). But I needed to make some for one of the looks in my senior collection, so with some help from my professor, I was able to make a pair of real trousers. All I have left to do on them is the waistband! 7. 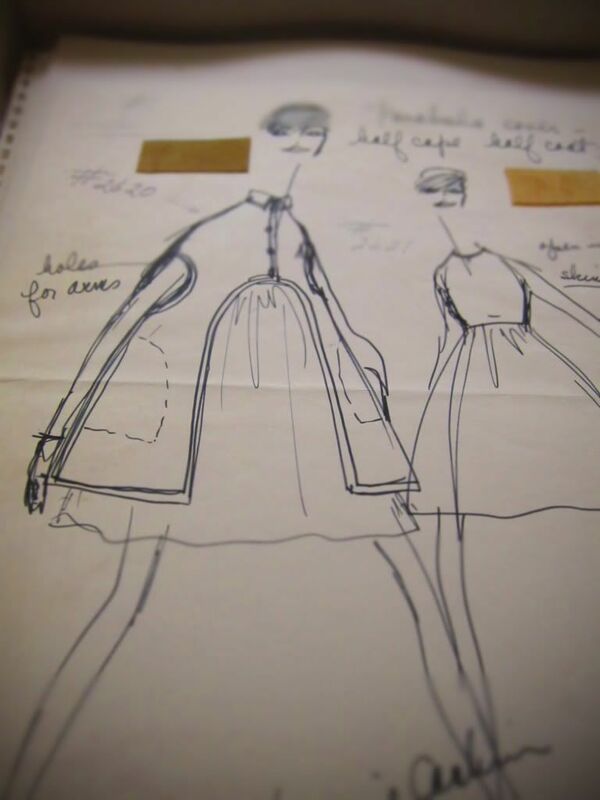 This weekend I would like to essentially finish all machine-sewing for my senior collection. I think I can do it. :) I can hand-sew and knit when I'm at home, and I'll have my sewing machine with me, but after getting my wisdom teeth out on Monday morning I won't want to be upright because I will be in pain and look like this little guy. Except less adorable and more whiny. Also, guess what I got in the mail yesterday? My wonderful craft exchange package from Lexie, that's what. It is seriously the cutest thing ever and I can't wait to share the lovely crafts she sent me with all of you! I'll be posting photos in the next few days. Yay! 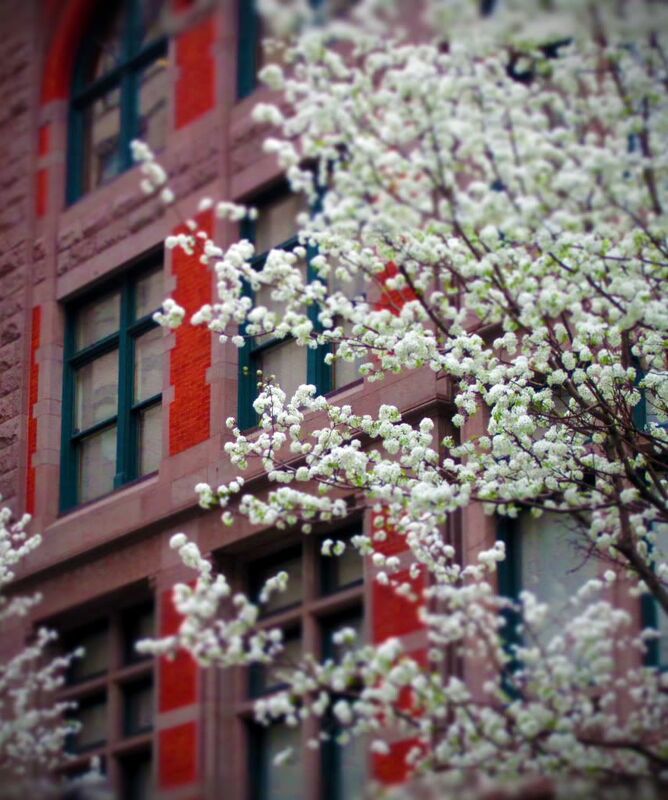 As beautiful as these trees are during the day, I think they might be even prettier at night. 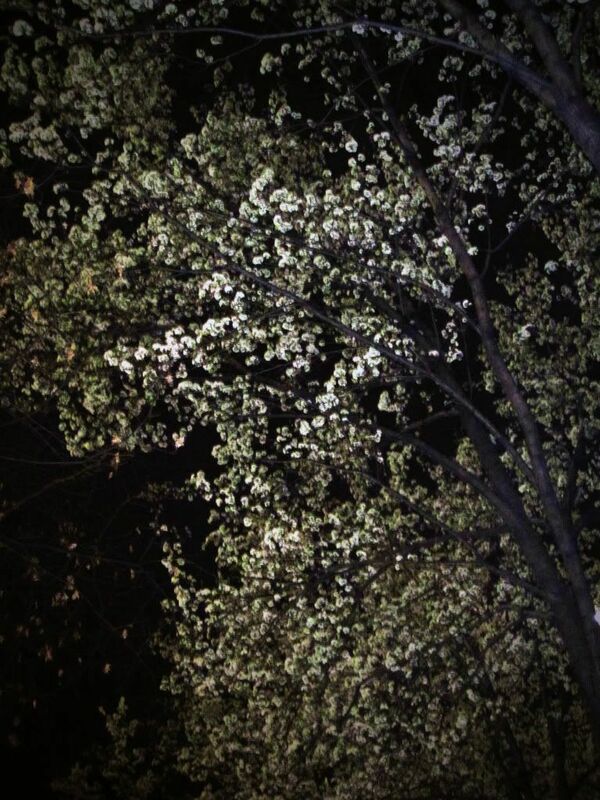 These beautiful ornamental pear trees are blooming all over the city. I love them! So pretty! and then I came home and sewed for the rest of the day. 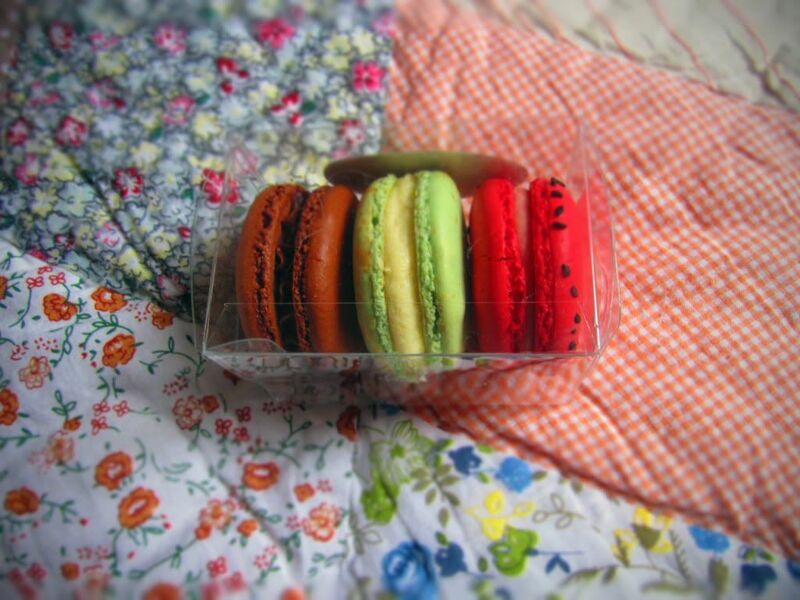 Except when I was taking breaks to nibble the macarons. one of my errands was getting that yarn! yarn-getting errands are ok with me. also, the chocolate macaron was delicious. the strawberry thyme one was, too. the french riviera one? not so much. although to be fair, I'm not sure what it was supposed to taste like because I bought it strictly based on prettiness. 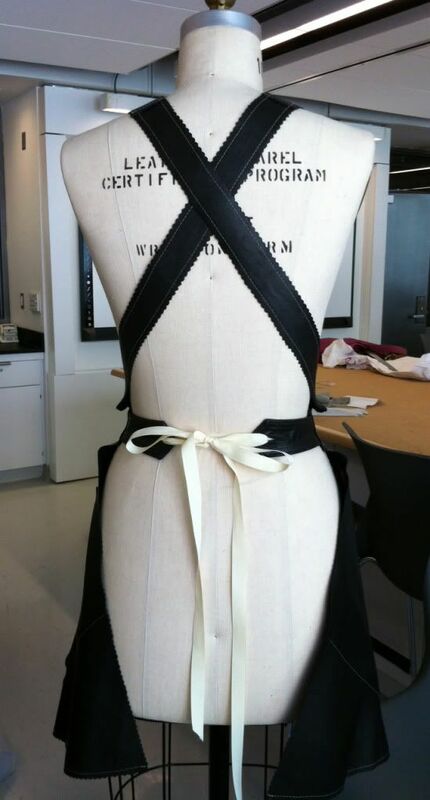 And this morning in my senior collection class, I got to see the results of my weekend-of-sewing. including the two back panels (already finished), the bodice of this dress has 60 rows of fluting. This was the single most time-consuming element of my entire senior collection, so progress should be much quicker now! Yay! 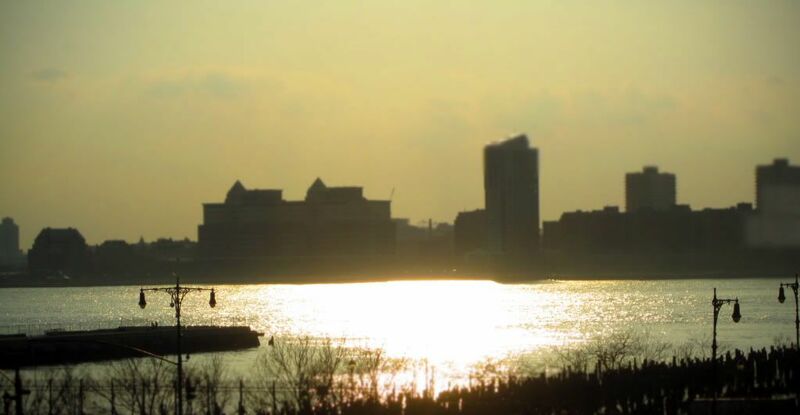 I hope your week started off well too, and that you have a lovely Monday evening! 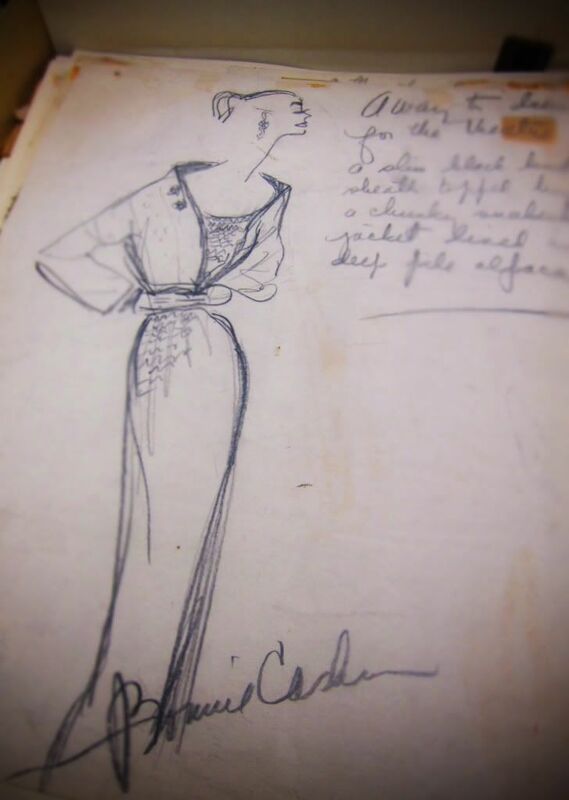 Last week, my leather class went over to the Special Collections of the FIT library to look at some of Bonnie Cashin's original sketchbooks. 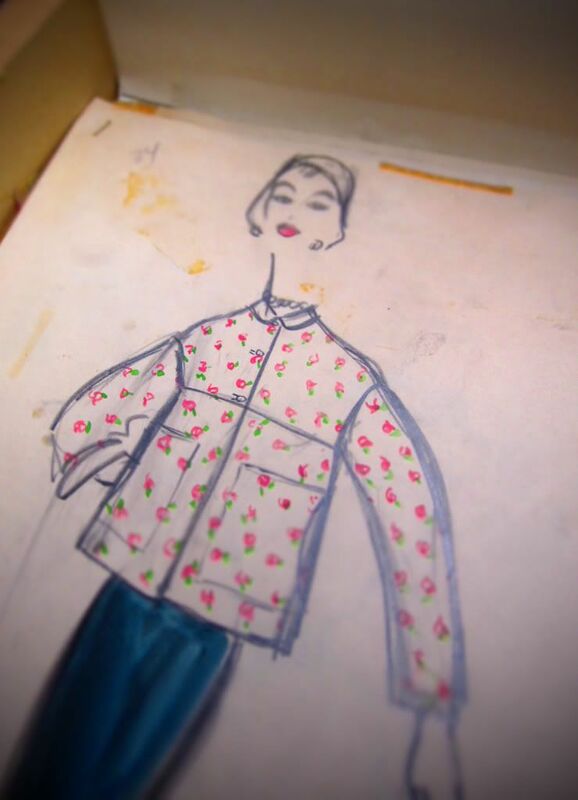 Bonnie Cashin was a designer who started her career in the 1950s. 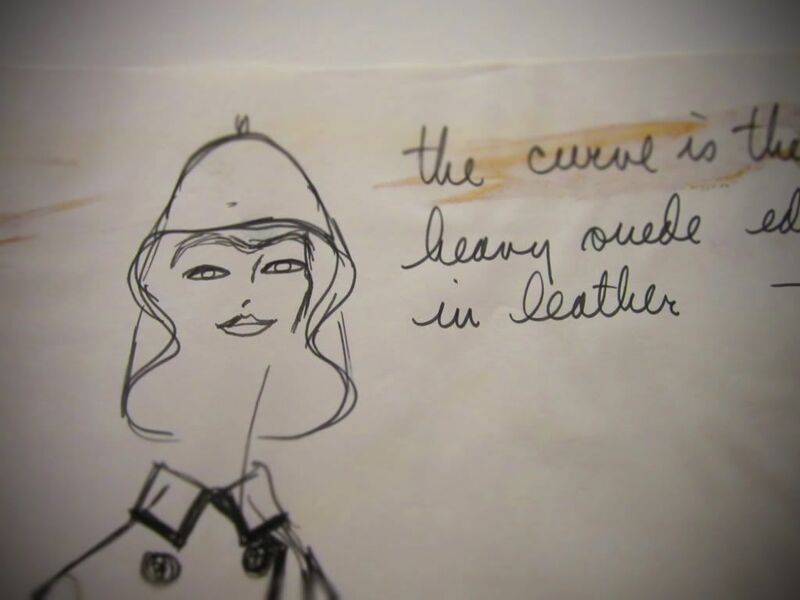 She was known for using leather in unexpected ways. look how cute this girl is in her little hat! 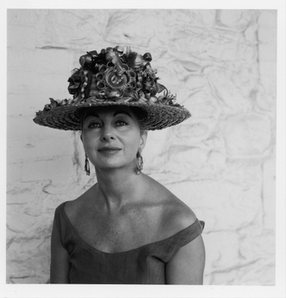 this is Bonnie Cashin in 1960. seeing this photo made me laugh because one of the jokes-that-is-actually-true in fashion illustration is that everyone draws girls that look like themselves. Miss Bonnie was no exception. 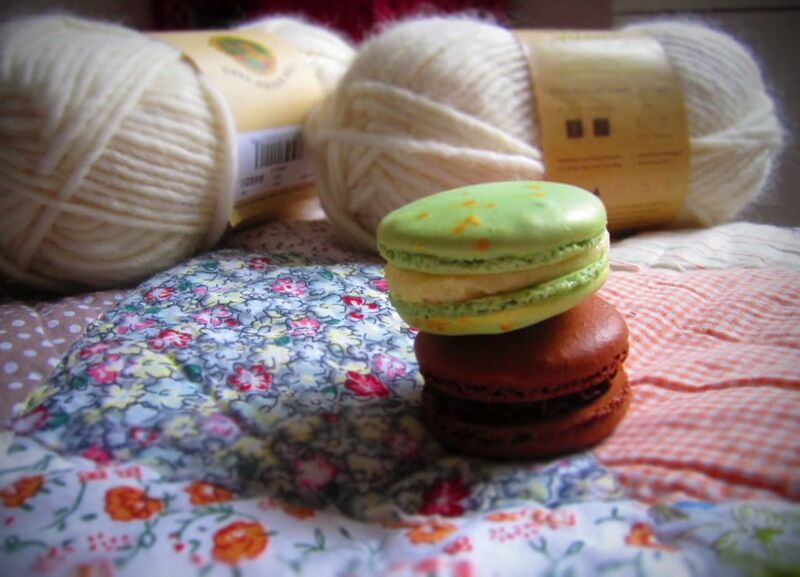 Now I'm off to have my ideal Sunday-- Petco to pet the cats, then buying yarn for my senior collection, then getting a macaron, then coming home and sewing for the rest of the day. Any fun Sunday plans? What's your ideal Sunday? you can receive a 20% discount on any order from Julie Rose Sews on Etsy just by entering the code 'SENIORCOLLECTION' at checkout! yay! 1. 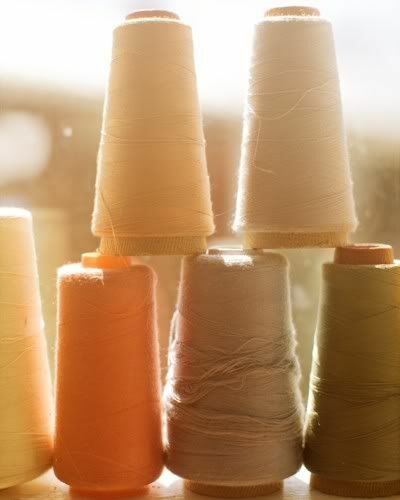 My favorite color is either a pale, peachy-pink, light blue, pale grey, deep brown...I like a lot of colors. 2. My home decor color palette includes a lot of eggshell, because I live in a dorm room and that's the color the walls are painted. But I like it, it's a good base. In general, there's a lot of pink happening in my room, too, and I have a big round blue chair. The recent addition of my Oh To Dream bedding has added a lovely pale grey, too. 3. Other people always tell me I look good in the color red-- I'm really, really pale, so red makes me look all pink-cheeked and cute instead of my usual glow-in-the-dark hue. 4. The color I detest is greenish-brown. I love brown when it's deep and reddish, like a chestnut or cherry wood, but greenish-brown is not a pretty color to me. 5. If you were to look in my closet, you would see mostly pastels, neutrals like cream and fawn brown, and black. 6. A color that I simply cannot pull off no matter how hard I try is orange. Well, actually, I don't know, maybe I look lovely in orange, but the world will never know because I just can't bring myself to buy anything orange. It just seems like such a loud color, and I'm a bit more quiet. 7. The color of my favorite dress is eeeek, I can't choose my favorite dress, I love them all! Especially because I wear dresses almost exclusively. One of my favorite parts about going to FIT is seeing how different people interpret the same set of guidelines for projects. I think it's so interesting how a group of people can receive the same information, but each end up with a vastly different result. So when I heard about the Idiom Photo Project, I was instantly intrigued. It's run by two photojournalism majors at Ohio University, one of whom I went to preschool and high school with, and the basic premise is that participants are given a new phrase and a new individual word every week. Then they go out and take a photograph that captures the meaning of that word or phrase to them. At the end of the week, all the submissions are posted on the Idiom site. Can we be honest for a second here? We can do that, right? Okay. So, I am not a photographer. I'm just a girl with a little pink point-and-shoot camera (yes, it's pink. Of course it's pink.) who likes taking pictures. My school program can get pretty stressful, and I like having a creative outlet that isn't graded. I really wanted to submit a photo to the Idiom Photo Project, but I was nervous that mine would be somehow less legitimate because I don't study photography or have a DSLR camera (although learning more about photography and getting a grown-up camera are on my list of things to do eventually). I waffled for quite some time before convincing myself to click the send button on my submission email. But I eventually did, yay! The photo I took was for the 'Here Comes The Sun' phrase assignment, along with some gorgeous photos by other people participating in the Idiom Photo Project. Have you ever wanted to do something, but needed to muster up some creative courage? Please pardon the silence here in blog-land for the past few days, my wonderful best friend Marissa was up for the weekend and we were busy having lots of fun. 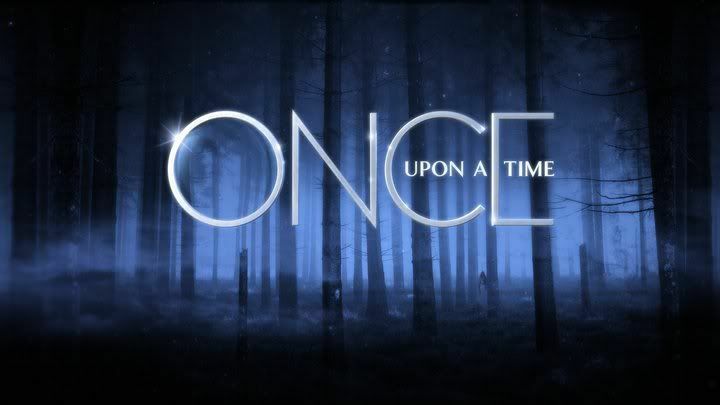 One of the things we were busy doing was watching Once Upon a Time. I had never seen it before and I. Am. Obsessed. Snow White is my favorite based purely on how adorable her hair and clothing are. 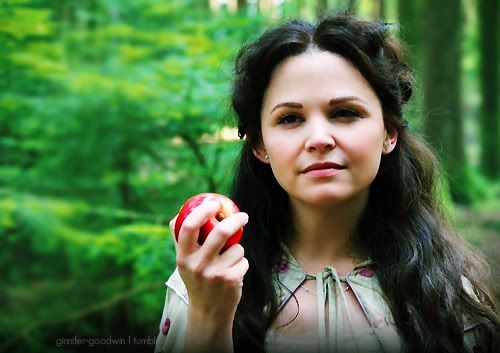 Her real-world alter ego is Mary Margaret, who wears a lot of super-cute outfits. I think my reaction to Mary Margaret's apartment was to grab Marissa's arm and shriek "OH MY GOSH I NEED IT I NEED IT RIGHT NOW!" So now I'm completely hooked on the show. Anyone else watch it? Who's your favorite character? 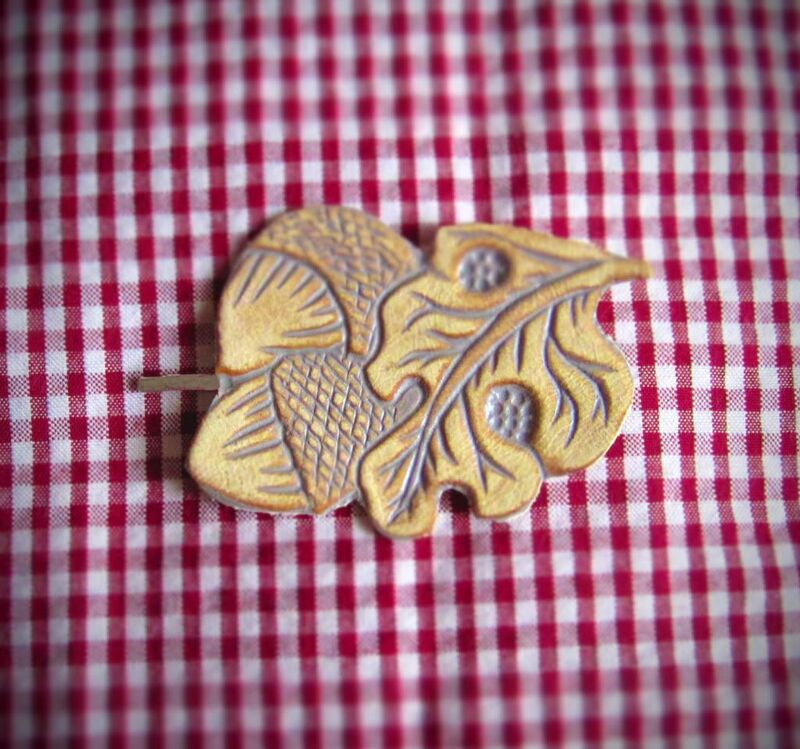 I'm having a 20% off sale over at Julie Rose Sews on Etsy! Just enter the code 'SENIORCOLLECTION' at checkout. We've been treated to some absolutely beautiful weather lately here in Manhattan, which, for me, means lots of walking around outside. 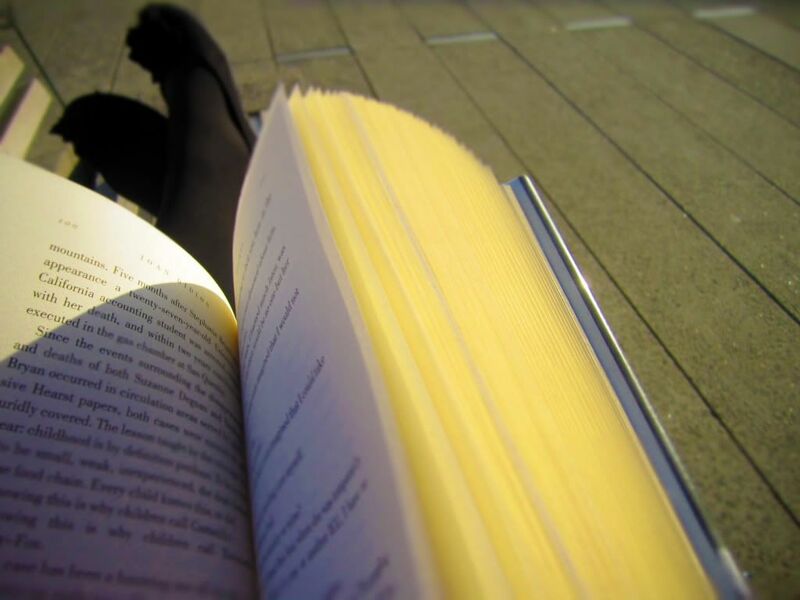 reading on the High Line... one of my favorite warm-weather activities. 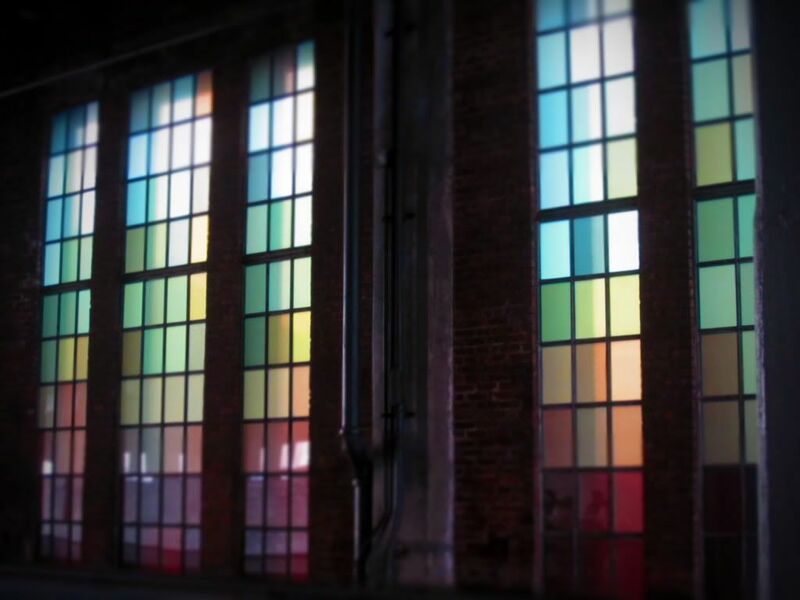 I love when the sunlight catches these windows at just the right angle to show how many colors they are, and not just the green-and-brown that they appear in the shade. the sunset was gorgeous, turning everything gold. the weather was so beautiful that I stayed on the High line for 188 pages. What's better than one favorite thing? Two of my favorite things came together recently! Ok, actually they are two of my favorite people. Not things. There's a series on Hulu called A Day in the Life that films people for one full day, and recently they put out an episode about Marc Maron, the guy behind the WTF podcast (which I've previously mentioned here) and one of the things he does on the day of filming is to interview Mindy Kaling, one of the writers and the actress who plays Kello Kapoor on The Office. I love the WTF podcast. I love The Office, especially Mindy Kaling. This is a winning combination. You can listen to the full episode of WTF with the Mindy Kaling interview here. It's a really good one. note: neither the video nor the podcast are particularly child-friendly or work-appropriate. you've been warned. One of my favorite things about the WTF podcast is how much it makes me realize that everybody has stuff that they're going through. Marc Maron has a refreshing willingness to be vulnerable and he also brings that out in the guests he interviews on the podcast. I've listened to most of the available episodes and it's been inspiring to hear the personal intimate stories of so many comedians and what they've had to deal with and overcome while still managing to stay in a career where their job is to be funny. I highly, highly recommend giving the WTF podcast a listen, and this episode would be a good first one if you already like The Office. What podcasts do you listen to? 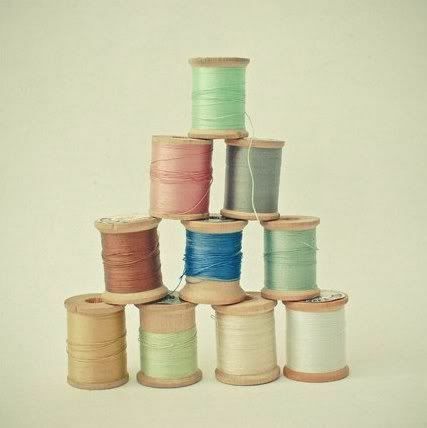 It's sewing season and I'd love some listening recommendations. Today we had our first model fitting. We were able to put our pieces, in either fabric or muslin, or a combination of the two, on three sweet and beautiful models to test the fit. It was so exciting! My fitting went well-- my pants need a few adjustments, but that isn't too surprising considering that they'll be worn by a real, live person after being draped on a stationary dress form. 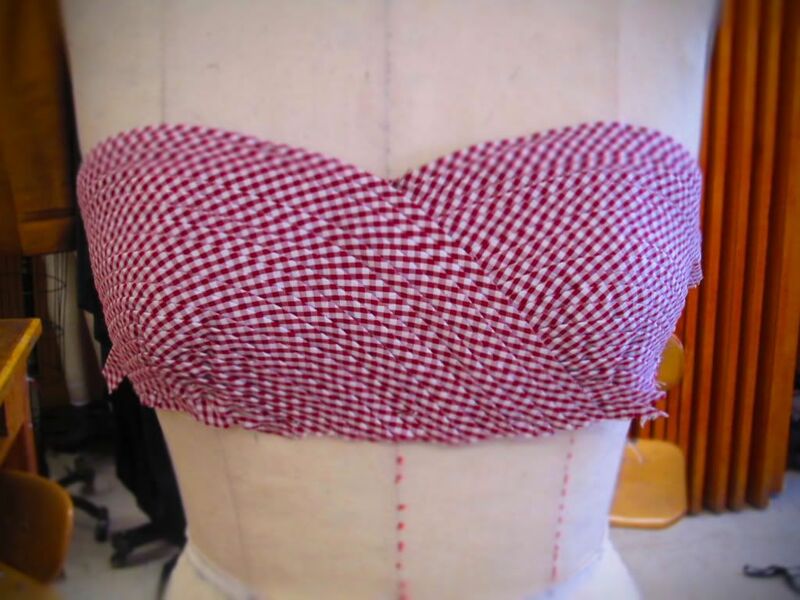 One piece that really came to life on the model was my burgundy-and-white gingham dress, the one that will be fluted at the bust and has a full skirt. I made the crinoline (an underskirt made of stiff netting, to give the skirt lots of body) and attached it to the outer fabric over the weekend, and it looked just how I hoped it would-- full, flouncy, and fun! I made another muslin of the sweater out of a fleece blanket the same weight as my sweater-knit so that I could make any fitting adjustments, too, and now I'm ready to sew of the pieces in their final fabrics! Yay! Here's the original design illustration from my portfolio. 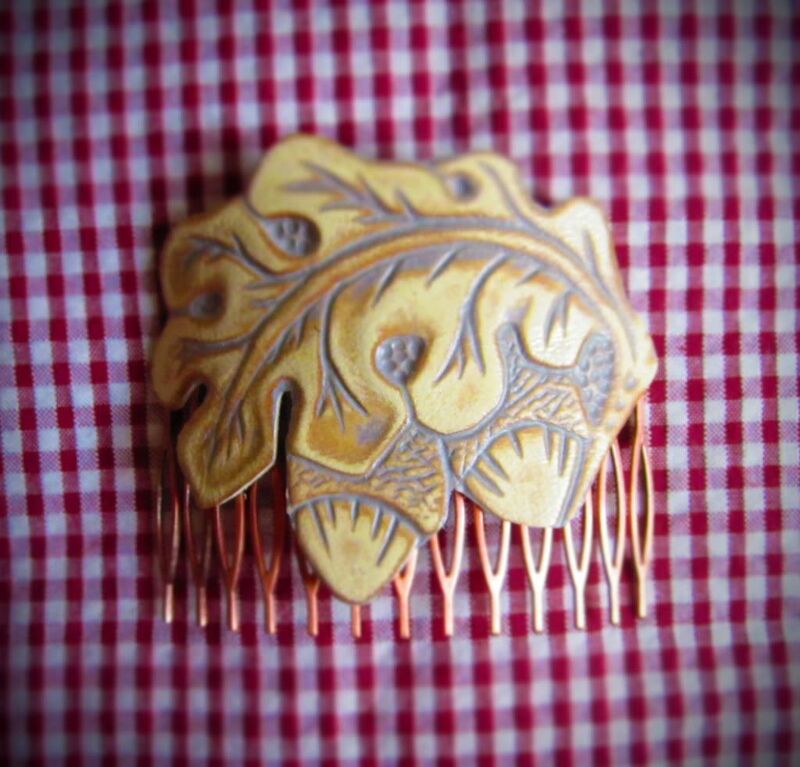 To go along with all the senior collection festivities, I'm offering a special promotion in my Etsy shop. Enter the code 'SENIORCOLLECTION' at checkout to receive 20% off your entire order. Are you working on a fun, creative project? I'd love to hear about it! It's always great to read the words of people who love their art. 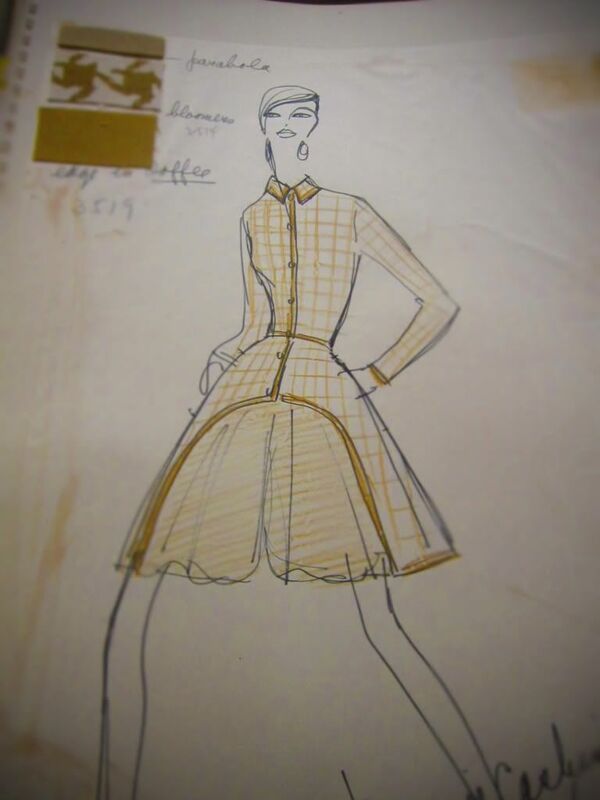 to read more about my senior collection, check out this post. 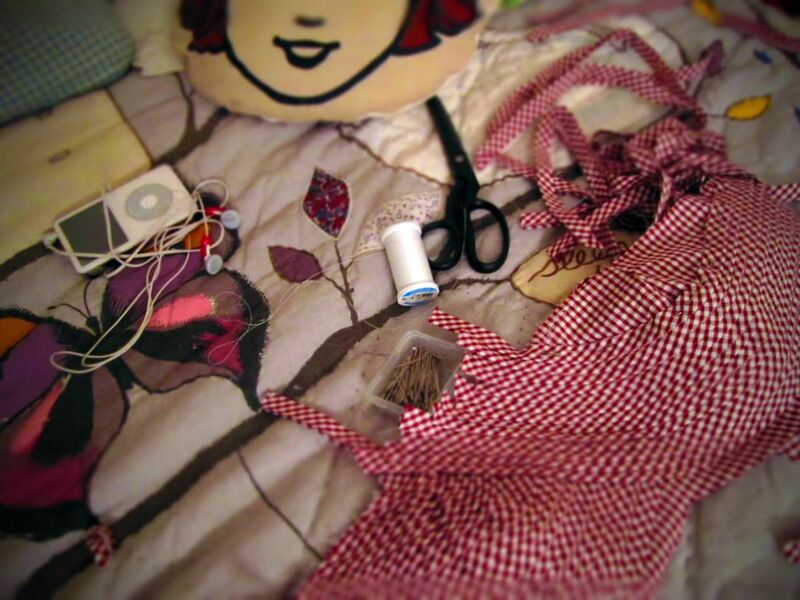 Still sewing the day away in my sunny little room. Here's what I'm listening to. hope everyone's having a cozy, relaxing Sunday! 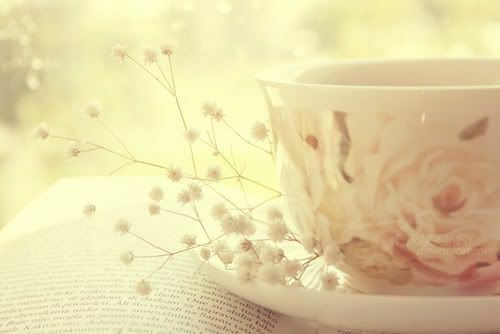 I can't quite decipher the watermark on the teacup photo to link to the original source. if you're able to, pretty please let me know? 1. My favorite room in my house is: I'm actually going to mention that I live in a college dormitory for the majority of the year, so I live in one room that functions as my bedroom, kitchen, living room, and studio. And I love it. I've always liked small-space living, actually. In seventh grade we had to design our dream house for a tech. ed. class and mine was a very small octagonal house with a spiral staircase in the middle that didn't actually go anywhere. I just wanted to have it there so I could sit at the top. 2. My current decor style is cozy, feminine nature-child but I wish it were more uncluttered. That's the problem with having standard-issue college furniture-- it's not really tailored to the needs of a fashion design student (please excuse my terrible pun) and while it's good for storing notebooks and papers, things of that nature, there's really nowhere to store fabric and big weirdly shaped rulers. Once I'm in my own place (aaaaaah!!!!) I'll have more flexible storage arrangements. 3. I wish I could redecorate my floor to make it something other than orange. Whose brilliant idea was that? Actually, the carpet in my room is orange, too. I am cursed to always have orange floors, apparently. 4. My dream house absolutely has to have lots of light, and maybe even a windowseat. I do so love a good windowseat. 5. One house item I'm willing to splurge on is a nice bed and good bedding. 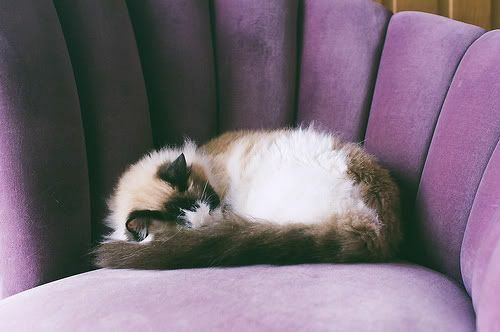 I'm a cranky girl if I don't sleep well, and we spend a third of our lives asleep, so I think it's worth it to spend that time in cute and comforting place. 6. A decor trend that I just don't "get" is severely chipping paint. I loooove the cottage-y, shabby-chic look and I know that brand new coats of paint can seem artificial, but seeing bits of my house chipping away would leave me feeling uncomfortably vulnerable. Not to mention the high chance that paint old enough to be chipping like that contains lead, endangering any chats or enfants in the area. I' much prefer a new matte-finish coat of paint, even if it doesn't look as genuinely cottage-y. 7. Cozy blankets, twinkle lights, battery-operated tea lights, and lots of mugs for tea are little touches that make my house feel like home. I wrote a few weeks ago about my frustration with finding a topic for my memoir class, mentioning how I'm generally quite a private person (despite all evidence to the contrary, given that I'm writing this on a public blog, which quite literally exists for other people to read) and how while I love to read memoirs, writing down intimate details of my life to share with others is not so much my thing. I managed to write one piece that I was reasonably pleased with, and it got a good reaction from my classmates, and I felt like I was getting somewhere with this whole experience-sharing business. 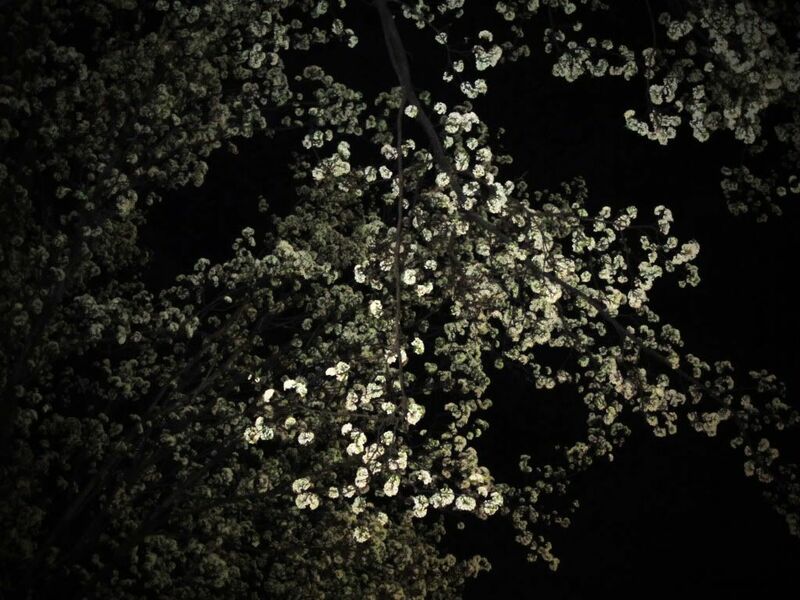 But even with that piece, there were details that I deliberately omitted-- the memory was too close to my heart to share more than a glimpse into it. When it came time to write the next piece, I was stuck right up until the night before class. I decided pretty early on in the semester that I wouldn't be writing about losing my dad and everything that led up to it. It's still much too soon for me to be able to think about it without crying, never mind sharing it with a class. But it made me wonder if I was being neglectful or disrespectful to my dad's memory by not writing about it, because it's truly the most intensely painful and impactful thing that I've ever experienced. It's on my mind constantly, he's on my mind constantly. But writing about it in detail felt out of the question, and not only would it be really, really difficult for me to write. My dad's life shouldn't be defined by its ending. Instead, I started writing about some of my favorite memories of my childhood-- coming home from school and spending time with my family and the special bond that we shared and still share. Finally, a subject about which I have years and years of experience and emotion. 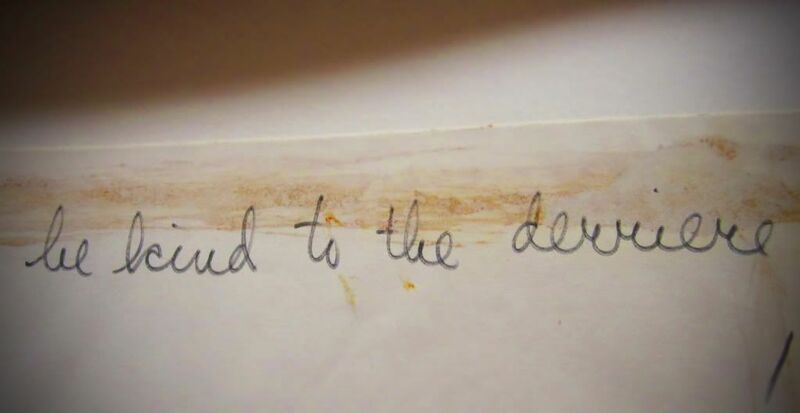 Writing memories from my childhood, which was as wonderful a childhood as anyone could ever ask for, was bittersweet. I'm so relieved to finally be able to remember life before my dad got sick. The good memories are slowly making their way to the top of my mind instead of being firmly pushed down by the upsetting ones. After my professor read my memoir fragment on Monday, she said "It's lovely...I was just talking with [another professor at my school] about how if someone were to write a deep, heartfelt memoir about a happy experience, we'd love to read it, but those aren't generally things people write memoirs about. Keep writing about this-- a happy childhood is rare and the rest of us who didn't have one can live vicariously through reading about it." Her words really resonated with me. My blissful childhood was an event that deserves description just as much as any of the devastating memories. As much as I'm enjoying recalling happier times, it's also painful. 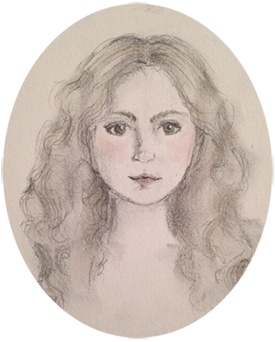 As I wrote about the simple pleasure of coming home from school and opening into the door to our wonderful, welcoming hobbit-hole of a house and saying hello to my parents, I couldn't suppress one thought from circling in my mind. How could everything have gone so wrong? It's a question that I'll never have a satisfactory answer to. And that is really, really difficult to live with--the idea that tragic things can happen completely arbitrarily. Right now, though, I'm trying to find comfort in exploring my recollections of a time before I ever asked that question. I'm trying to honor my dad by remembering his life and how joyful my family's lives were together. I'm trying to remember that before everything went wrong, everything was right. if you're interested in the memoir fragment that inspired this blog post, feel free to read it here. My senior collection is moving right along, yay! Yesterday we presented our finished muslins. translation: we presented the "rough draft" of our garments in unbleached cotton. This is a swingy A-line coat with big angled patch pockets and a peter pan collar. It's worn over a button-back top and narrow pants. 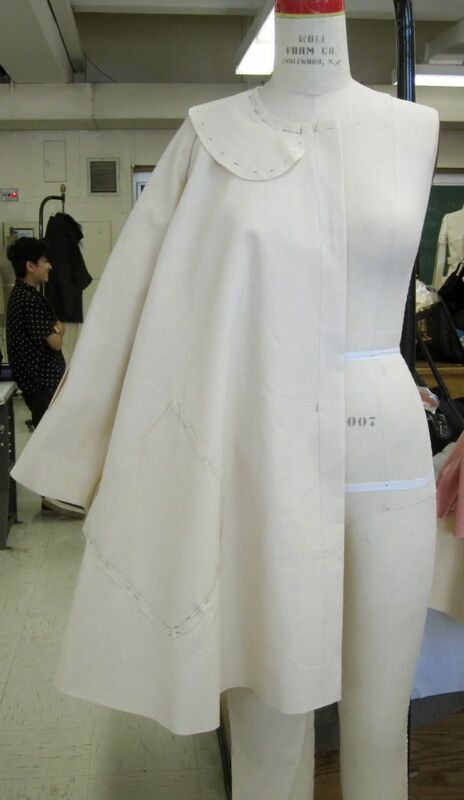 This will be a little strapless dress with a full skirt and petticoat, topped with a cozy belted cardigan with a soft face-framing hood which will be shown more effectively on a model that has, y'know, a head. 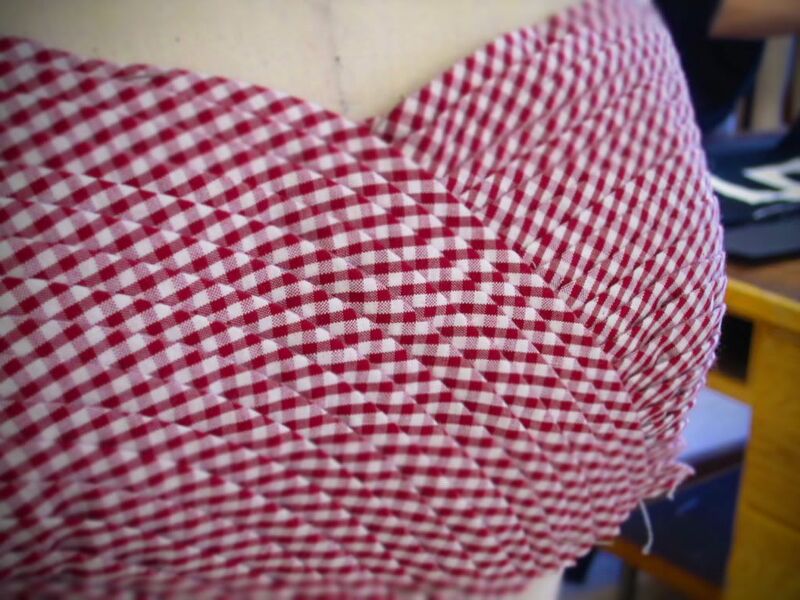 The bust and upper back of the dress will have fluting in this cute gingham. 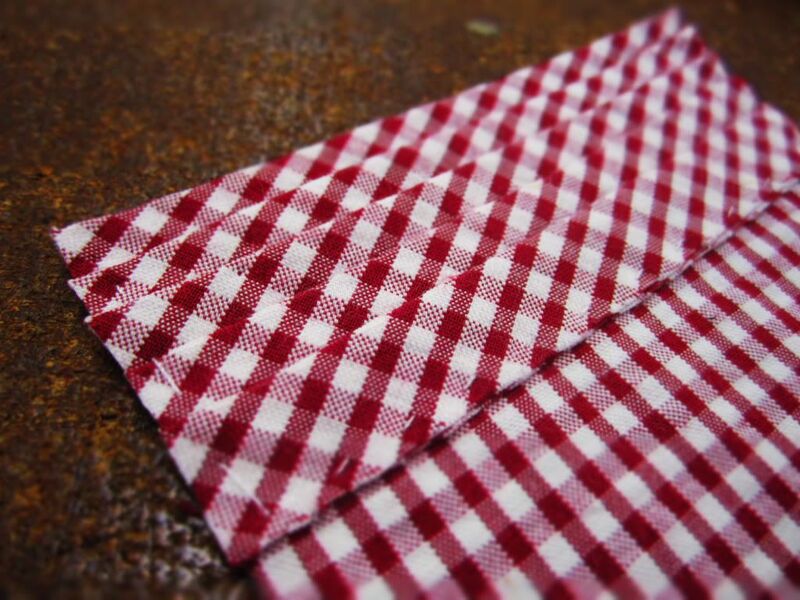 I love fluting with gingham because I love how it looks on the bias! I've purchased all of my collection fabric! and let me tell you, there will be no fun anthropologie treats for me this month. 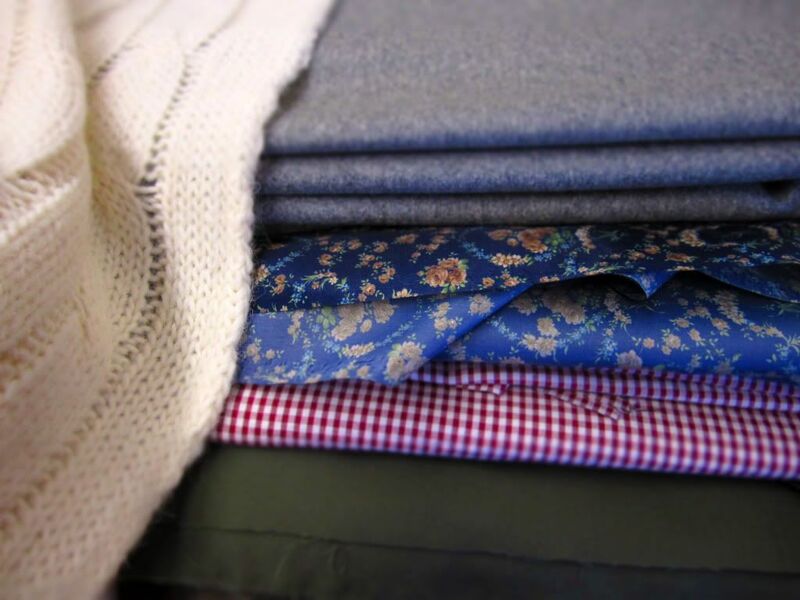 From left to right, a soft sweater-knit for the cardigan, a cozy gray wool/cashmere blend for the coat, adorable floral lining for the coat, gingham cotton seersucker for the dress and top, and cotton twill for the pant. 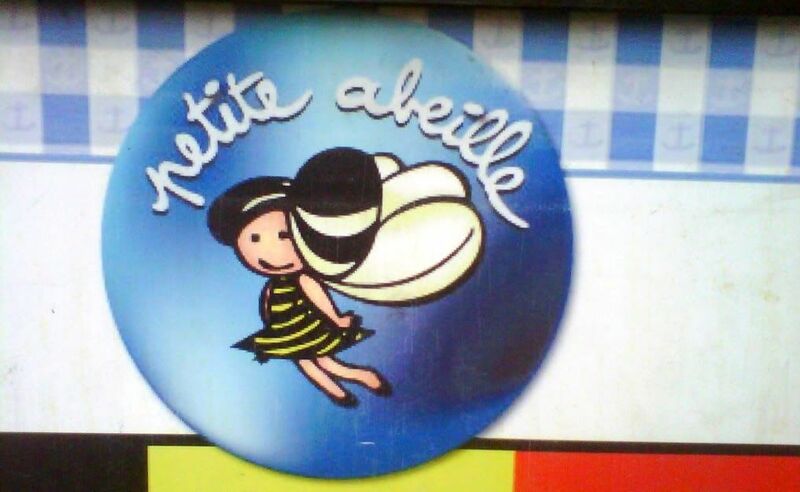 How precious is this sign for the Petite Abeille restaurant? I came across it when I was walking around the other day. I thought it was appropriate because this little bee will be verrrrry busy for the next month or so! I'll be going home for spring break at the beginning of April, which I'm looking forward to, buuuut it's to get my wisdom teeth out. Not so excited about that. So I'm going to be working away as fast as I can, because I'd really like to be essentially finished with my collection before I go into chipmunk-mode. Thank you so much for all the kind words following the loss of my precious kitty, Chachi. Your support helped me through a very rough few days. As did going to Petco daily to cuddle all the cats there.